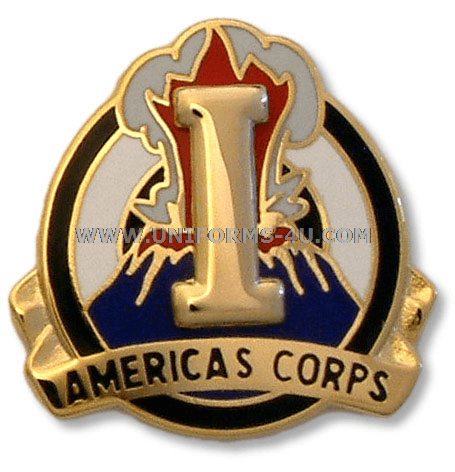 The I Corps' Unit Crest, officially called a Distinctive Unit Insignia, is replete with symbols of the unit's combat history—a far cry from the simple design of its Combat Service ID Badge (CSIB). An erupting volcano represents the Corps' battles in Australia, the Philippines, New Guinea, and Japan, as well as subsequent service in Korea and at Fort Lewis, Washington—all of which are located in the Pacific "Ring of Fire." The flame and smoke stand for the hardening brought about by combat in two World Wars and the Korean conflict. Besides the unit designation, the Roman numeral "I" highlights the fact that it was the first Army Corps to see combat in two wars. 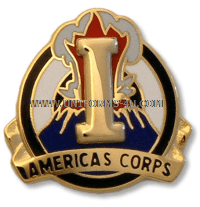 "America's Corps," the unit's nickname, is centered in a scroll along the bottom.